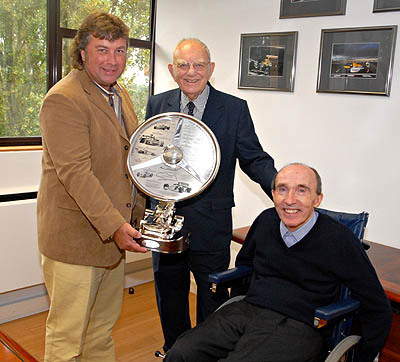 Frank Williams has been awarded the Tom Wheatcroft trophy in recognition of his contribution to world motorsport. The trophy was presented to Frank at a ceremony at the team's headquarters at Grove by the Wheatcroft family. Inspired by his father's involvement in motorsport, Tom's son Kevin established the Tom Wheatcroft trophy in 2002 to recognise personalities who have made significant contributions to the motorsport world and industry. Since its inauguration, names such as Murray Walker, Professor Sid Watkins and Bernie Ecclestone have all been honoured with the award, while Frank receives the trophy from its 2007 recipient, Sir Stirling Moss. The trophy itself represents an historic racing car steering wheel mounted on a sculptural interpretation of the Grand Prix car driven by Tom's protégé, Roger Williamson. Just a few of Tom Wheatcroft's achievements as team owner, constructor and owner of Donington Park and Grand Prix Collection are illustrated on the trophy. Upon receiving the award, Frank Williams commented, "When I heard that I was to receive the award, I was truly honoured. To join the list of formidable recipients of the Tom Wheatcroft trophy is a rare privilege. I've never forgotten the wet race at Donington in 1993, not so much for the thrashing that Ayrton gave us, but for the fact that the race was privately funded by Tom, driven by his love and enthusiasm for the motor racing." Kevin Wheatcroft said, "It is an honour to be giving the trophy to Frank today. All the recipients of the Tom Wheatcroft trophy have a long history in the sport and have made a considerable contribution to the industry. This trophy is our way of giving something back; it's a heartfelt thank you to the people that make the sport what it is."